- ITP ATV tires are sold individually. - Our ATV tires generally ship out within 1 business day! 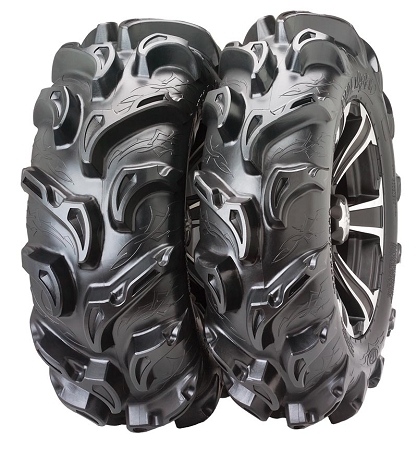 ITP has added another incredible tire to their impressive lineup of ATV tires. The Mega Mayhem is a new and improved version of the original Mayhem tires. The Mega Mayhem is equipped with a super aggressive 1.5" lug that can handle any type of mud you take it through. It's tread design gives you a smooth ride on the hard packed terrains and it's lightweight design won't robb all of your power. Those are two features that are very difficult to find in a real aggressive mud tire. The tread on the mega mayhem is very similar to the Maxxis Zilla tires which have been a huge success. The 6 ply rating of this tire gives you peace of mind as you take your ATV out into unexplored territory. Mount a set of these on your machine & you'll notice an increase in turning ability as well as being able to start/stop with more control. ITP tires are made in the United States which is a possitve factor for many of our customers. I put a set of 28x11-14 on the rear of my 2011 Commander And running stock fronts down here in Florida where there is mostly soft sand and water. Some hard pack as well. First off I noticed an unexpected feel on the trail of very lose feel to the rear upon entering corners and take offs. Once they start to slide they quickly start to grab and get you through it without feeling like you were out of control. This feel was so apparent that my wife, riding as a passenger, was asking me what was wrong with our machine and I even stopped twice to get out to check to make sure I had not broken a bead and was running on a flat. Riding these tires at 7psi all day never had a bead problem. After a bit of time riding I started feeling more and more confident in the tires and pushed them harder and harder. Tho they would get a loose in the start of the corner I could compensate for it and it actually made it fun to run because I could drift around corners if desired yet I never felt as if they would not gain traction if I let off the throttle. But it should be know that the loose feel is there. Maybe running at a higher psi would help but I don't see it making too much of a difference. The tires held the bead very well and when in the wet muddy nasty stuff they grabbed very well pulled me through and I never put my 1000 Commander into 4wd. Not No Outlaws but they are up there in the ratings with them yet less likely to aggressively grab a root and break an axle. Overall I'm happy with the purchase and would buy them again considering the price. One main thing to note is the 28s are pretty true to height (two I have one measured 28 1/8 and other 27 3/4) but both only measured 9 7/8 for widest tread to tread width which is over an inch less than stocks or said 11" see/search YouTube vid to see for your self. I just put the ITP mega mayhems on my 2005 Arctic cat 500. I love everything about them except they run small. If you are looking for a 27in. tire I would order 28's if you want 26'ss get 27's. Other than that these tires grip very well in the snow and are great in water and mud so far. Have the mega meyhams on my side by side and all i can say is look out these things are crazy sick in the nasty gumbo mud and far as getting you down the road in thru the woods to get to it is insane. Such a great ride for having 1-1/2" lugs wud deff buy theses tires again and again and the guys at pureoffroad are #1 to deal wt and shipping was super fast as always. Customer service is top notch ! Spencer went the extra mile helping me with my order ! Received my order at my door in just three days ! I'm a very happy customer and would absolutely do business with them again ! Great All Tire For Any Terrain! This is by far the best online transaction i have ever had! The shipping was extremly fast. I had them the very next day. Also, very pleased with these tires. I've had them on pavement at 50mph and in plenty of mud. They are great at both! They dig like crazy on my 700 Grizzly! Thanks again and the videos are the reason i bought from this website. They took the quess work out of what my tires would look like. Very helpful! Got these tires for my boyfriend for his 2013 CanAm Renegade 1000X. He loves them!! He did a bunch of research on these tires and decided on these. So excited!! Amsome tires, I can go threw the mud in 2 wheel where my brother has to go in 4 !! I love the mega mayhems mounted to the MSA wheels. The tires have decent bite in the slop for being a semie lite weight mud tire. 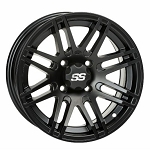 As for the MSA wheels, well .. You can go wrong for the price. You can purchase different add ons with different colours. I am impressed so far with this combo and will stick with it for while for sure. I put 28-11-14 around my can am Outland Max xt. Let me tell you my riding partners could not follow me through the DEEP mud holes(they have factory tires on there atvs). I had to get used to the ride, do to the extra height, and the looseness on the rear when turning corners. I love the look and feel of the Mega Mayham tires, and will buy another pair when I wear these out. 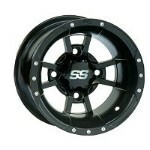 this is my third set of mayhems we love the tire Pure OffRoad is the only place to order tire wheel combos for us. The tires do great in the mud and super fast shipping! All i can say is great ppl to deal with and fastest shipping ive ever seen and you wont find a beter price with free shipping and if you do buy it. This is my second set of tires ive bought and will be buying a third set from pureoffroad here very soon for my other bike. Just put these on my 08 Outlander MAX 800 and they are excellent in the mud. They amazingly still have great trail manners. I did not think that a mud tire that aggressive could still handle like these on the trail! I found myself using 2wd most of the day. Could not get these tires stuck! I put these tires on a 2010 Arctic cat 700.27 inchers and All I can say is WOW! Took them through a mud hole where id usaully need 4wd but these i just creeped through in 2wd foward and reverse. Fast shipping came to my door in 3 days. Enjoy doing future business with pureoffroad. 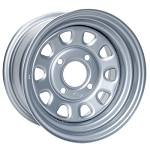 Q: Will the 28x9x12 and 28x11x12 fit on my stock rims for a 2015 Yamaha Viking?